Set in historic Uptown, this hotel is ideally located just a few minutes from the Spanish Quarter, Castillo de San Marcos and the Fountain of Youth. After a day of sight-seeing or enjoying the nearby beaches, unwind in a stylish guest room featuring modern conveniences such as a 42-inch HDTV, WiFi access and a luxurious Sweet Dreams® by DoubleTree bed. 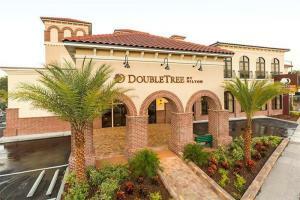 Work out at the 24-hour fitness center or relax by the outdoor heated pool, surrounded by tropical landscaping. Castillo de San Marcos, the Fountain of Youth, Fort Matanzas, Alligator Farm, Amelia Island, Fountain of Youth, Limelight Theater, Lightner Museum, Potter's Wax Museum, St. George Street, Vilano Beach, Ripley's Believe it or Not!